A little over 6 years ago, I became a dad. Less than a month later, I wrote an article about saving for college. I thought I’d do something I call “Then and Now.” The idea is to look at an old blog post, review it, and update it for now. I feel that the value of a blog is the journey. Otherwise, you might as well just create a website. Here we’ll see how things have changed in the first trimester of our college financial planning. I think we’ll find that not only has our family has changed, the world has changed, and my knowledge of the saving for college has changed. Life would be boring if nothing changed over six years, right? Let’s get started with my 2012 view. Then we’ll get to my 2019 view. That’s a question that my friend Kevin asked me probably around 3 years ago. It was a simple question. He had recently had a son and he wanted to put aside money to cover his education. Kudos to him for starting early. The question lead me to write this article: Saving for College – An Exercise in Depression. In hindsight, it was a total cop-out as I never did answer his question. Today, I think I’m going to do better… hopefully a lot better. I have a vested interest this time around. My own son is four weeks old today and I’m in Kevin’s shoes (not entirely, but I’ll get to that the end). I got in reminder about all this from CollegeAdvantage, the place I determined had the best 529 plan for my niece and nephew. Specifically their newsletter had this image on the right (click for a larger view). The part that caught my attention is the bottom that assumed annual deposits of $2,400. For all practical purposes (minus some interest compounding) that’s $200 a month. This didn’t answer Kevin’s question, but goes down the right track, giving me a good estimate of how much I’d have if I saved roughly $200 a month. However, it didn’t tell me how much college was going to be when Little Man is 18. Without this information I really can’t know how much to save. On the right you’ll see three headings with numbers below them, “Monthly, Interest, and College Increase.” These are the main variables that I’m playing with here. 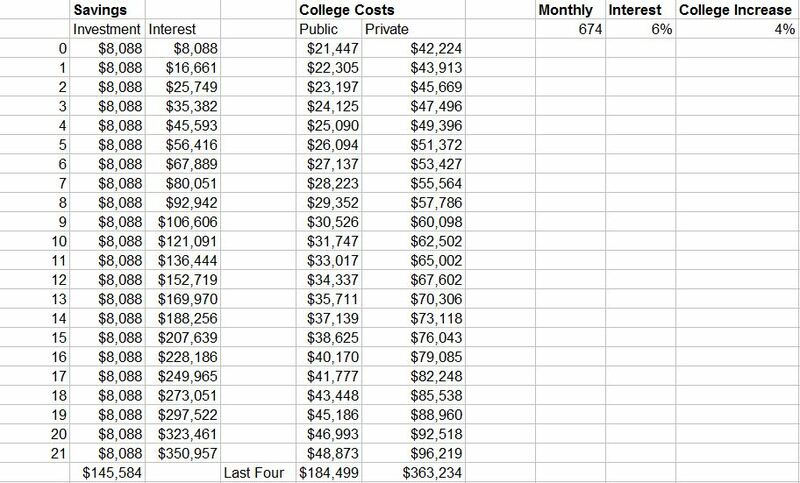 If I save $674 a month (more on that seemingly random number later) and earn 6% interest I’ll have the amount at the bottom of the “Interest” column under the Savings heading. The Interest column represents how much money I’d have at the end of year assuming deposits and interest. I could have titled this column better, but that’s the beauty of Excel, I’m getting to the numbers quickly. For fun I’ve totaled up the amount of actually cash I’d be putting aside by saving $674 a month. So putting $145,584 over time yields me $350,957 when Little Man is 21. I didn’t factor in taking the deductions out of this to actually pay for college, so there’s room for improvement here. It is important to remember that this is an estimate and there’s no guarantee of earning 6%. Now let’s turn our attention to the right column of College Costs. Using the “College Increase” value, I can estimate how much college might cost Little Man at age 18. The 4% is just a best guess. Ideally, I would know how much college costs are expected to go up over the next years. Perhaps some research group has a good answer there. I settled on 4% because quite honestly, if you put a 8% number in there the last year of private college is $212,000. I don’t see that happening. Even at 4% the last year being $96,000 looks pretty daunting. However, in 18 years it might not be. 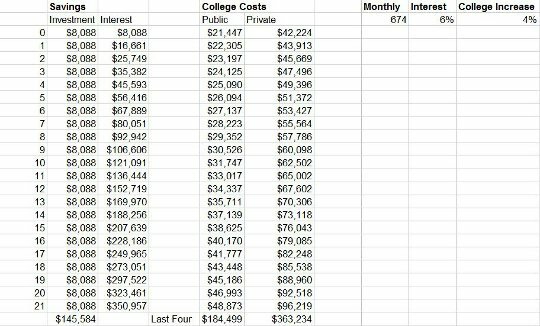 I’ve totaled up the last four years of the college costs and you can see that public college is likely to cost around $184,500 with private school costing $363,000. Now it becomes a little clear where that $674 a month came from… that amount gives me the $350,000 range that covers 4 years of private college. The last piece to the puzzle is where did I get the information for the public and private school costs to start with right now? The answer is Collegeboard’s annual estimates. They did all the heavy lifting give me a number for how much an average public or private college would cost with most of the typical fees rolled in. So now that I’ve gone through all this math, let me make things easy for you. Saving for College has a College Cost and Savings Calculator, which is dead simple. You just put in a child’s age and it tells you a number that you need to save. I put in $0 just now and it came up with a $602 number that I have to save each month. From there, you can adjust the scenarios just like I could with my Excel spreadsheet. If I had seen this calculator first, I would have skipped the spreadsheet, but the spreadsheet does give me helpful checkpoints. When I did it a couple of weeks ago, I believe that number was $674. When I plugged that $674 number into my Excel spreadsheet things started to fall into place. The calculator from Savings for College also has a lot of other valuable information. For example, it assumes a 6% cost of college increase using historical information. The 4% assumption in my spreadsheet looks to have been an underestimation. If that stands true, the last year of private school for Little Man is going to cost $143,543. Zoinks! There are still a few different factors at play here. Going back to the CollegeAdvantage chart, there are taxes to consider, but 529 plans can help with that. If you are saving in a regular brokerage account, who knows what long-term capital gains are going to be at that time? Again, you just take your best guess and adjust as you get closer. Now for the fun part… I get to throw most of this research in the trash. It turns out that Little Man appears to be eligible to get free public education thanks to my wife’s GI Bill with the military. I knew that it was a tremendous benefit, but this exercise has put it in a whole new light. Kevin’s simple question about 9 years ago as his son was born is still an important one: How Much Do I Need to Save For College? Did he need to put aside $50, $100, $200, or even $500 a month to cover his new son’s college expenses. At the time I got depressed doing math of saving for college, as college costs were going up as fast as the average stock investment was projected to. The end result: Expecting compound interest to help your college investment seemed doomed to failure. It’s important to note that he viewed paying for his son’s college as a strong financial goal. Living in Silicon Valley at the time, I believe he had the income flexibility to put significant money towards that goal. Now (2019), I feel it is more necessary to talk our feelings about college costs. For this article, I’m going to put aside the question of whether you should or shouldn’t pay for your kids’ college. Kevin felt strongly about paying 100% of the costs. I feel strongly about helping, but also that the kids have to have some skin in the game. Other people may not be in a position to help at all. We all come from different backgrounds and have different philosophies on this topic. Instead, I’m going to do my best to work with the objective math of paying for 100% for college costs. You can always adjust it to suit your parenting style/philosophy. Then (2012), we had my wife’s GI Bill that would cover Little Man’s public college schooling for 4 years. It even covers some living expenses. Now (2019), we have two kids. We have to split the benefit between them. That means there’s a gap that we have to save for. The original question was for one kid… and that easy answer was the GI bill. Now things are different. Remember these numbers were from 2015. I used the average cost of public and private college that year and assumed a 3% increase each year. Years ago, I thought it would increase at 7%, but those numbers just got really, really crazy. I’m going to start with the summary first and work backwards. 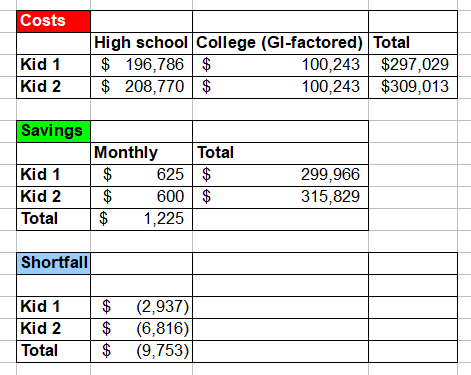 The summary adds up the high school costs (the four years in bold in the high school column) and the college costs (the four years in bold in the average college column). Because I don’t know if if the kids will go to public or private school, I averaged the costs of the two. 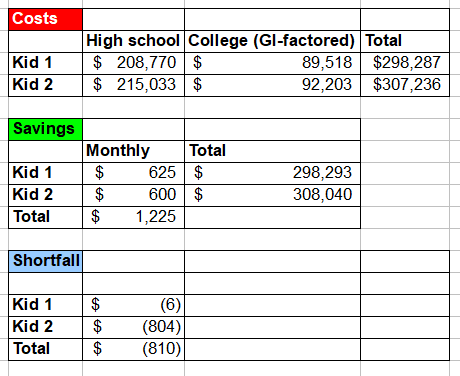 The college cost is divided in half which is an estimate of using my wife’s GI Bill. I then added up those numbers coming to around $300,000 for each kid (one a little more and one a little less). Once I knew that my goal was to save $300,000 each, I could play with the monthly savings number and projected investment gains (estimated at 7%). It turns out that I needed to put $625 for kid 1 and $600 for kid 2 to come up with those kind of numbers. That’s a lot of money, but remember that the high school would be the expensive part, and I don’t see it happening (my wife doesn’t necessarily agree with me on this). If we were only concerned with college, we’d have a much more manageable amount of around $220 for each kid to cover the estimated gap not covered by the GI Bill. Of course 2015 numbers aren’t relevant. I’ve updated the same three charts above for 2019. One thing that stood out to me is that the costs of college didn’t go up 3% every year as I expected. Overall, they went up 7% in the three years total. I had expected it to go up more than 9%. This math assumes that one were to start saving from scratch now. How Much Do You Need to Save for College? This is a lot of math that is very specific to our family and our financial situation. I don’t expect the numbers to mean much to you. What I’d like for you to take away from this is the process. It isn’t perfect. It makes a lot of assumptions that will eventually be shown to be wrong. However, there’s value in doing this exercise at least every few years. I learn something new every time I do it. Finally, I continue to get more data and that helps my planning over time. 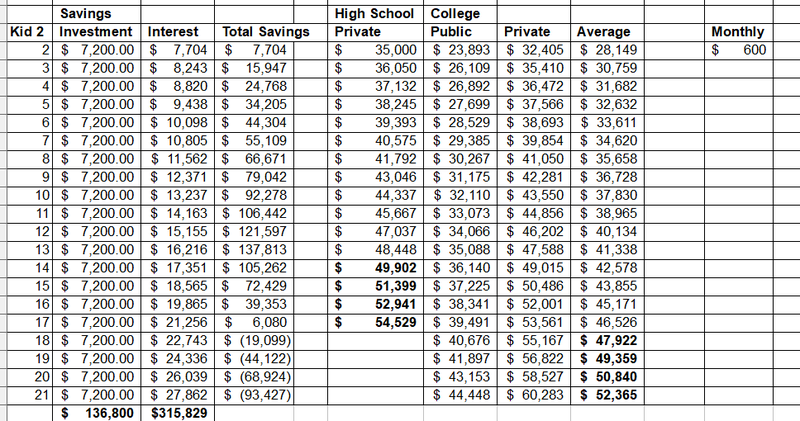 Have you planned how much you need to save for college? Has the plan changed over time? Let me know in the comments. I’m curious how many people are intending to foot 100% of the bill for their kids. I came from very modest means, and as a result, it was up to me to finance 100% of my college education. I think the experience was good for me, and that your focus is often better when you have some “skin” in the game. I definitely want my kids (age 5 and 3) to share some of the cost. Yeah, the how much should you pay is an entirely different topic. I thought about addressing that at the end of the article, but it was long enough without getting on that tangent. I agree with you on this having skin in the game. I got a full scholarship and I know I was willing to skip a few classes as long as the result was the degree. My wife had to foot much of the bill herself and she wasn’t skipping any of the classes she paid for. Let me ask this… how much is a good split of the costs? Around here, it seems common in divorce decrees to have each parent be responsible for 1/3 and the kid also be responsible for 1/3. It might even be a law – I have no idea. So maybe 1/3 could be a starting point for the discussion. Funny that you should mention that 1/3rd number. I was thinking of suggesting that parents do a 200% match for funds added by the child, which comes out to be the same thing. I am a senior in high school, so this is practically my life right now. My family was always too poor to save money until recently, so I don’t have a college fund and have to rely on scholarships. College prices are insane now days, and I hope something changes so your 4 year old doesn’t have to go through what I am currently going through. Thanks for you comment Cassi. I’m surprised to hear the story having followed your aunt for some time. Nice math. I should do an update for our son too. I checked recently and we’ll need about $210,000 to send our son to UCSB, our alma mater. That’s the in-state price. We’ll have to move to CA, but we’re fine with that. Currently, his 529 has about $70,000 in it. We only contribute about $400/month so it looks like it’ll be short. I think that’s fine. He can work and/or get some financial aid and scholarships. The kid needs to have some skin in the game, for sure. Life has been too easy for him. He needs to go through some hard times too. I wonder if my estimates are a little low then. I know the UC schools are good (I lived in CA for 6 years), but I thought they were cheaper than that for in-state tuition. Maybe they are projected to go up 5% or so instead of the 3% that I have. That inflation number is the one that makes the biggest difference. That’s also why I like to check in every few years to see where costs are really going. Also, these may be tuition numbers (I’d have to look it up), which is very different from overall costs. That $70,000 is a good start. From reading your blog, I think you’ve got 8-10 year of compounding time, so maybe it could get $140,000 and with other contributions get really close to $210,000. I don’t have kids, but if I did, I’d have your philosophy: help out, but make the kids work for it. Heck, I might even have not told them I was going to help — hopefully, letting them make more responsible decisions about how much to take out in loans — and then surprise them at graduation. I think it’s good that you’re planning all this out, and that your wife’s GI bill will help defray the cost for them somewhat. Good luck with the saving! I haven’t told them I was going to help yet, so maybe it could still be a surprise. It’s not like they are going to read this website :-). We saved up very little expressly for college because we could have easily cash flowed the three kids through our relatively inexpensive state schools. So all that happened when they all got 100% free rides is we just put what we would have spent on them into our retirement. You can’t do that unless you are a fairly high earner though. The thing is that if you have bright kids with a strong work ethic they will never have to pay for college. State universities are desperate for kids like that and free rides are routine. However you won’t know that until it is too late to save. Generally it is much easier to get scholarships in STEM fields, and pretty hard for liberal arts majors. That’s awesome. I think getting scholarships would be an ideal situation ;-). It’s still very early to know how they’ll be, but they appear to be bright. Only one seems to have a decent work ethic so far. We have investment properties that may be able to cashflow the GI Bill gap. So that might similar to you. I wonder if in 10 years when we are looking at schools whether the scholarships will swing back to liberal arts or at least find a middle ground. Interesting fact: I compared tuition to my private college alma mater, my husband’s state university alma mater, and my older daughter’s city college, and the difference amounted to the price of a house — over $200,000! We have one senior in HS and one who just graduated college. We always saved in a general fund, outside of college, b/c I could see that college costs were moving in their own Neverland very different than general incomes and market inflation. This worked out for us, as my older daughter got a full merit scholarship and so our general funds can go to her for something else she needs. For the younger one, we’ll have yet to see!